Jasmine belonged to my brother (Scott) and sister-in-law (Kim) who live next door. She recently turned twelve (I think, if not 13). Her health had deteriorated dramatically in the last 6 months. My husband (Brent) lived with Scott and Kim when Jasmine was just a puppy. They became the best of friends during the first several years of her life. I didn't become attached to Jasmine until we moved in next door. Kim would tell me how happy Jasmine was with us so close by. For Jasmine, our home was a retreat from her suddenly very busy home with toddlers running around. That's when Brent and Jasmine reconnected and I fell in love with her. -She always had the puppy-like response when you asked her to play ball. -She gave hugs and kisses. -She knew when we were sad and would stay near us. -She knocked on our door with her nose, asking for permission to come in. -She was gentle and sweet. The last two months are behind us. During those days we thought we were going to lose her two or three times. We knew the time was drawing near. Scott and Kim did everything to make her comfortable and shower her with affection. This morning, Scott knocked on my door. He told me it was time to say goodbye. Brent and I went over to see her one last time. She wagged her tail as much as her frail body would allow, the instant she saw Brent. Scott and Kim put her in the car and drove away. An hour passed and they came home. I asked what happened and was told Jasmine laid right down. She was ready to go. Cheers to Jasmine. The ultimate dog. There will never be another like her. 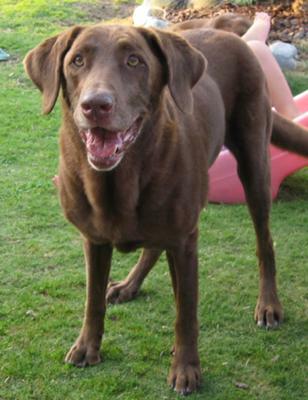 I also had a chocolate lab. There is just a special sweetness about this breed. Ours lived 14 years and left a big hole in our hearts for a long time when she died. Since that time we have had other dogs, but never one like our Mocha. Jasmine, you were so good to your people. They loved you and you them. They must have been really special people. I hope they know that all dogs go to that special place and wait for the people to come. Take care of yourselves, Jasmine's friends. Jasmine wants that!